The Basic Fundamentals of SEO. This article discusses the fundamentals of SEO. 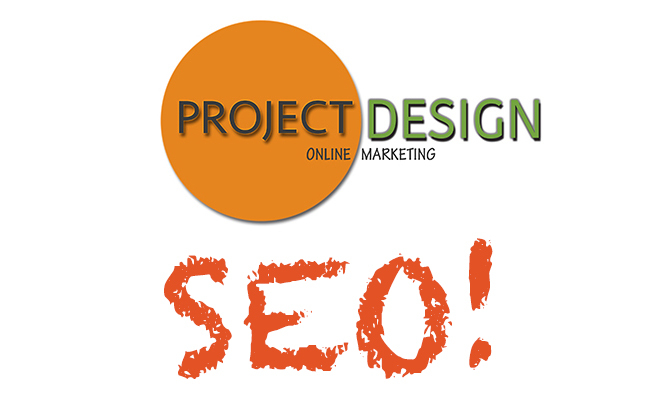 From now on SEO = Search Engine Optimization or Optimisation depending if you live in the USA or not. This is not a frivolous comment as you will learn later. If you think youve spotted a spelling mistake you may just be right but heres the first lesson what you think is right is not what someone else thinks is right. Always remember we are discussing the elusive and conceptual much of the time here. Its the Internet people anywhere in the world can tune it at the drop of a hat or click of a mouse is maybe a better way of putting itr. When a person types a search phrase like waterlilly into Google believe me the person was looking for a waterlilly and if youre not around to help them because you always spell waterlilly as water lily then you will have a NIL chance of selling to that person. Youll hear these terms all the time when web design discussions are taking place B2B (means business to business) and B2C (business to consumer). You’ll rarely hear what the conversation should be about namely P2P Or people to people. The Internet is the ultimate, most fundamental one-on-one marketing medium. If you truly understand this and embrace it then you will succeed far more easily. Even if your target audience is a business rather than a consumer the fact remains that you will be dealing with an individual and that individual has a need to satisfy somebody this might just mean keeping the boss happy. The person may be working for a company but that person is doing a specific job. You need to talk to that person not to that company or business. In fact businesses do not talk to anybody . And only people have credit cards not companies. In this book I always seem to talk about sales when I really mean Most Wanted Response to use Ken Evoys words, and the reason is simple. I want to keep everybody focused on an objective and making a sale is probably the best way to say the objective has been achieved better than any other word. However if your Most Wanted Response is to get a newsletter subscription or provide free family entertainment it does not matter you can only judge the success of your website by whether it makes the sale or MWR you wanted to get. There are so many really exceptional works of art, and design masterpieces on the web. Many are literally stunning but they do not get any visitors and do not make any sales. The main reason is small amounts of traffic. On the other hand many websites are anything but design masterpieces yet get a great deal of traffic and make many sales. This I can tell you from personal experience because quite a few belong to me. I belong to the class of web designer that creates plain ordinary-looking websites that make money. The first objective of any website design is to attract traffic and unless you have really deep pockets by far the best way to achieve this is to get free traffic from search engines like Google, Yahoo, MSN, Teoma and your favorite local engine (Ananzi maybe if you live in South Africa). A large chunk of the rest of this book is designed to help you get that traffic. And on the Internet you need lots of traffic because conversion of any initial traffic to a final sale is typically not more than 1%. What this means to you is that if 10,000 visitors arrive at your home page the chances are that a maximum of 100 will do what you want them to do. To get 10,000 people to visit your home page means that you will need to attract maybe 100,000 to the initial search engine results page or SERP. Already youre a little scared no doubt because these are big numbers and there is a mass of competition out there. These numbers are very broad and in actual practice nobody knows the real numbers. Despite this lack of precision conventional wisdom as well as personal experience suggests these numbers are very close to reality for most. Google, Yahoo and Others To prevent repetition I talk mainly about Google. Most of what applies to Google applies to the other major search engines. 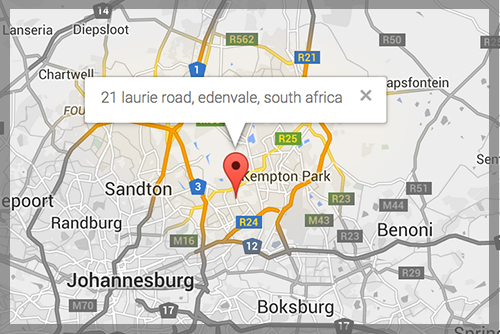 The results within the left hand side region are free or organic search engine results pages called SERPs. By free I mean Google does not expect any payment to get shown here whereas to appear within the area to the right of the page Google expects payment. These search results are called PPC or Pay per Click search results. There are normally 10 SERPs per page and up to 10 PPC results per page (now up to 11). If you or I as a searcher click on an organic SERP (left hand side) we go to the web page (note web page . not website) shown by the green URL for each individual SERP. On the other hand if we click on the right hand side results then the organization appearing will immediately owe Google money for that click. This vital approach to successful SEO is discussed briefly later. For the time being we are focused on the left hand side SERPs only. 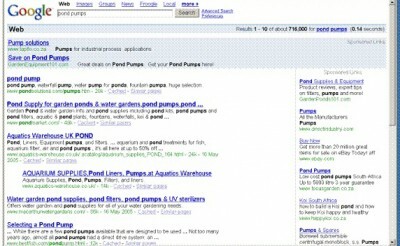 SERP’s (on left) and PPC results (on right) for Google search. The amount of traffic that will click through to your web page will depend upon where you are in this list of SERPs. Generally speaking position number 1 will generate about 3 or 4 times as many click-throughs (called CTRs) to your web page than would be the case if you were in position 5. This is why everybody wants to be number 1 on page 1 at Google and of course this is just not possible. Position number 10 on page 1 will generate about 10% of the traffic that you would have got in position number 1. The bad news is that if youre only on page 2 it will be lower than this. The really bad news is that if your SERP detail is only on page 4 expect tiny amounts of traffic searching for the phrase pond pumps to ever visit your web page. Let me stress here that these results apply to a single search phrase only pond pumps. 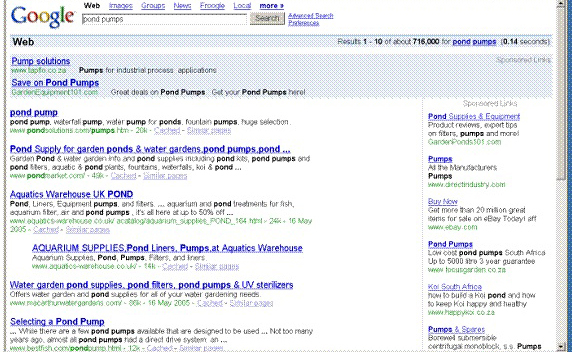 If you saw the SERPs for the phrase pond pump you would see a different set of results although some of the same web pages may appear the same (owners of those web pages understand how to get found on search engines). Im pretty sure if youve thought about whats just been said youll have realized one immediate opportunity to do better on any search engine increase your chances of being found by discovering lots of real search words and phrases that real people are actually typing into the search engines and not what you think they are typing in. We call these keywords. Keyword discovery and application are the subject of important later chapters. It is the discovery of these keywords that assists greatly in both getting found and getting attention the internet term is targeted visitors. This is what we really want to achieve through our SEO efforts not just visitors for the sake of it. We seek targeted visitors. Your website will only possibly get attention if it is targeted to the search query made by that person doing the search at that point in time. Your web page must immediately seem to satisfy the immediate need of the searcher for the person to even consider further exploration of the website as a whole. Searchers are fleet of foot, impatient and totally selfish. Searchers with needs to satisfy do not care one iota for you, your company or your websites appearance. If you feel you need confirmation of this just think of your own search behaviour. Once this fundamental is truly appreciated attracting attention to your web page is much easier but getting the attracted visitor to stick around is far from easy. Take a look at this graph for the month of April 2005 from one of my websites. It shows the number of people who saw my web pages and how long on average they viewed the web pages before leaving. Time Spent On Visitor Sessions to Website. During the month there were 43,731 sessions (ie visits to the website this included all web pages not just the home page). Of these sessions 28,472 lasted less than 10 seconds. This is quite sobering especially when you consider yourself better than average. 76% of all sessions lasted less than 1 minute and 92% less than 10 minutes. The point of introducing the table here is to confirm that website visitors are fickle and unless they see immediately that the website is likely to answer their immediate need they are gone just like the wind. For your interest despite this massive initial bale-out the average time an eye was trained on one or other of my web pages on this single domain was 2 mins and 45 seconds. People who like to boast about their websites will always tell you how many Hits the website got. Lets explore Hits for a moment Hits are a technical term and have little meaning for you or me. If you have a web page and that web page has 20 images (every image link for example is just that an image) then every time that one web page appears on screen 21 Hits are recorded. In simple terms that single page had 20 image files and the page itself was a file so a total of 21 Hits were recorded. One page-view in this case received 20 Hits in web speak terms. As you can see Hits are quite meaningless gobbledygook. What is meaningful is that there was a single page-view and probably one visitor saw your web page although maybe only for a split second. Always remember Hits do not carry credit cards, and neither do page-views either but visitors do. Hence a successful working website must get the attention of visitors encourage them to stick around a while. It is rather pointless to get thousands of visitors to your website only for them to find that what they see does not meet their requirements. This happens in an extremely large percentage of cases. There is something quite unique to the web here people are able to determine in an extremely short space of time (less than 5 seconds as you saw above) whether a web page might suit their need and deserve a more in-depth look. Your own surfing or browsing experience I have no doubt confirms this. 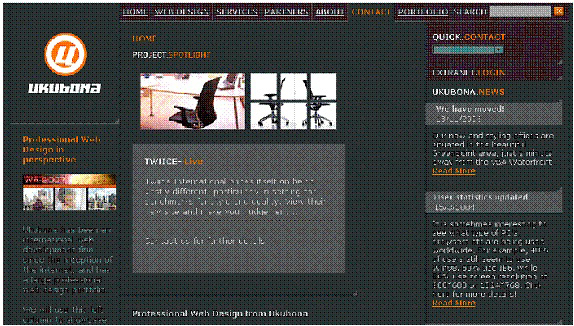 Heres an image below of a web page that I use to illustrate a fundamental web design flaw to me as a surfer this website is about office furniture. As such unless Im looking for office furniture I would have no need to dwell on this page for more than 1 second. However this page is the home page (or was at the time) of a web design company. Im pretty sure that if I’d typed web design into Google and then been presented with this page I could have mistakenly thought it was about office furniture and gone onto the next SERP. Good SEO is just not about getting traffic its about getting targeted traffic and attracting the searchers attention so they look around and explore the website in more detail. A Website That Easily Attracts the WRONG Kind of Attention. This site is not about office furniture.